I will not go into all the details, but we were blessed with an abundance of corn this summer…65 bushels to be exact. Most of it we gave to others, some went to the animals we have, but I was able to put up 40+ quarts of cut off corn and almost 100 ears of corn on the cob. In a large fry pan, melt one stick of butter on medium heat. DON’T JUDGE! I said it was the Southern Style, not the healthy style. When the butter melts, add the corn, salt, and pepper. Cook for 6-8 minutes until the corn is cooked and most of the liquid has evaporated. Note: The corn I froze was cooked prior to freezing, so if you are using fresh corn kernels it may take a little longer. With fresh corn you might need to add a little water to prevent from sticking. 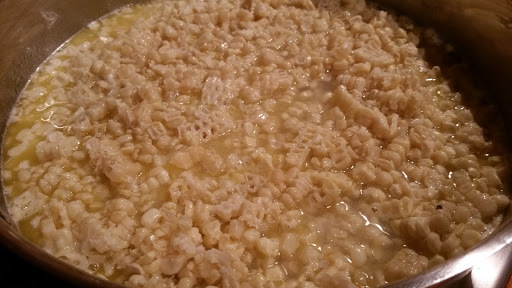 Mix flour and 1/4 cup milk until all lumps disappear then add to corn. Stir well and cook until thick. Add milk and continue to cook on low to medium-low heat for 10-15 minutes. Begin with one cup of milk and if it is too thick continue adding about 1/4 cup at time until it reaches the desired consistency. If you want a really, really rich tasting corn use half and half in place of whole milk. You can also use heavy cream or evaporated milk. I haven’t tried coconut milk but that would probably be great too!